Though there's only been some minor tweaking done to the Kia Sorento for 2017, that isn't cause for any concern. In fact, the undoubted rationale for maintaining the status quo is that the SUV/Crossover was already a darn fine vehicle, with lots of equipment stuffed into it, and even without a major overhaul it's still highly competitive in the crowded market niche of mid-sized utility vehicles. Chalk up another win for Kia. The South Korean carmaker's 2017 Sportage is a handsome and enjoyable vehicle that's full of modern technology and safety features. It's decent to drive, too. And fortunately, it comes with a warranty - not that that's unique. But read on! Any carmaker who doesn't yet get it that the South Koreans are not only here to stay but are taking them on head to head need look only at the new Kia Sorento. It's a terrific SUV/crossover that should have the more established brands sitting up and taking notice. Even at Kia Canada's sample's all-in (sans fees, etc.) price of $46,695 it seems like an excellent value considering what you get. And with a base price of 27,495 it almost seems like a bargain- you still get a lot of loot for the looney, just not as many toys. It doesn't have a lot that's new for 2015, but Kia's Sportage "cute ute" SUV/crossover remains a compelling and competitive model in this crowded market niche. The Sportage is Kia's small SUV – as opposed to its big brother Sorento – and it goes head to head with such competitors as Hyundai's Tucson, the VW Tiguan, Mazda CX-5, Toyota RAV4, Nissan Rogue, Ford Escape etc. etc. ad nearly nauseam. It offers a lot of bang for your buck, as well as a good driving experience. It might sound a bit silly if you've never seen "My Mother the Car," but South Korean carmaker Kia really does have a soul in its product line, a little people hauler that offers a lot of fun, practicality and bang for the buck. And that's good for the owners' soul! And pocketbook. It may not look on the surface like it's undergone major changes, but Kia says its 2014 Sorento (click to open a slideshow in a new window) is over 80 percent new or redesigned significantly from the 2013 model. And that's a lot! The changes make the SUV/crossover an even more interesting choice than before - and the "old" Sorento was no slouch. While its name might sound like something out of a furniture store, Kia's new Cadenza sedan is a fine vehicle that's good to drive and comes with just about every feature you could imagine short of an onboard biffy. Korean carmakers are really on a roll, and if this brand new Kia Rondo is any indication, it doesn't look as if it will end any time soon. If the Japanese carmakers aren't looking over their shoulders and toward Korea already, the 2012 Kia Rio gives them even more reason to start doing exactly that. And they should. KIA's Sportage small SUV/CUV has taken a big leap forward with its current incarnation, going from being kind of the ugly stepsister in its niche to a handsome and competitive choice. 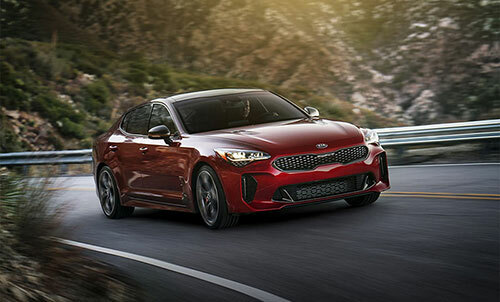 Kia definitely seems to be throwing down the gauntlet, and if they keep making cars like the new Optima, other manufacturers had better be looking over their shoulders. Let's start with the upside: the Kia Sorento. Supposedly all-new for 2011, it features a new unibody structure that's longer, lower and wider than before, as well as sporting what the company describes as "European-inspired styling." You can get it with seven-passenger seating, too.